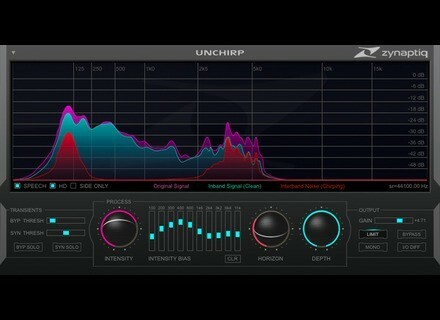 Unchirp, Audio restauration software from Zynaptiq. Zynaptiq will not introduce one but two new plug-ins tomorrow at Musikmesse, both designed for audio cleaning and restoring. 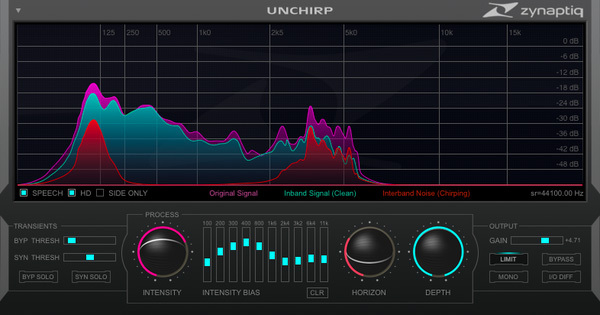 Unchirp will eliminate all artifacts that result from low quality audio encoding, de-noising or in files recorded with mobile devices. Unfilter will help eliminate filter and resonance effects or excessive equalization in real time using a de-convolution process. Slow flanger/chorus effects can also be processed and de-filtering parameters can be saved if you want to apply them on other audio files. Both plug-ins will be available in VST, AU, RTAS and AAX formats for Mac OS X and Windows. Unchirp will be released on May 6th, Unfilter is due to be released on May 20th. More details will be available soon on www.zynaptiq.com. [Musikmesse] iZotope Radius included in Ignite AIR Music Technology announces the iZotope Radius technology integration into its Ignite music software for M-Audio, Akai and Alesis keyboards. [Musikmesse] Nektar Impact LX49 MID keyboard Nektar will introduce tomorrow at Musikmesse the new Impact LX49 USB MIDI keyboard controller pre-mapped for most of DAWs. The OverTone DSP FC70 available on Mac A few days after releasing the Windows version, OverTone DSP announces the availability of the Mac OS X version of its FC-70 limiter plug-in.